Food industries are providing a wider range of food products to the consumers. These industries have generated considerable amounts of by-products and wastes, which cause many problems for environmental pollution. Currently, the utilization of the byproducts and discarded materials to develop new value-added products for commercial applications is getting much attention. Due to high nutritional and bioactive composition, the recovery of bioactive compounds from wastes and by-products is important for utilization in development of nutraceutical and pharmaceutical products. Avocado (Persea americana Mill.) is a tropical and subtropical fruit with high oil content, native from south central Mexico, but with global consumption. It is not only consumed as a fresh fruit, but also processed for food, cosmetic and pharmaceutical products to increase commercialisation and give a higher added value. Avocado (Persea americana Mill.) fruit possesses various beneficial effects due to its nutritional and bioactive compositions. Previously, numerous studies have reported the chemical and bioactivity composition of avocado pulp. Avocado pulp has been determined to possess the anti-cardiovascular, anti-aging, anti-cancer, antioxidant, and anti-inflammatory activities. Besides, 30% of avocado fruits are bio-wastes such as peel and seed that contain potential source of bioactive compounds. Avocado seed has a diverse application in treatment for diarrhea, dysentery, toothache, intestinal parasites, and skin treatment and beautification. Recently, the studies of avocado seed to apply them in functional food or food ingredients have got much attention by many researchers. Following this trend, this study mainly focused on the investigation of avocado seed components and its biological activities including antioxidant, anti-inflammation, and anti-cancer activities. Avocado seeds were collected from Dak Lak province, Vietnam. Solvent was purchased from Xilong (China). All other reagents were purchased from Sigma-Aldrich (St. Louis, MO, USA). The protein content was determined by Bradford method. Five hundred μL of sample was mixed with 2.5 mL of Bradford reagent for 10 min, and the absorbance of mixture was measured at 595 nm. The protein concentration was identified regarding protein standard curve of bull serum albumin. The total phenolic content of the extract was determined as described by Le et al.. The total phenolic content was calculated from the calibration curve, and the results were expressed as mg of gallic acid equivalent (GAE) per g dry weight extract (DWE). The avocado seed powder was soaked into ethanol (1 g/4 mL) for 4 h at 60 °C to achieve ethanol extract (ET). The concentrated ethanol extract was further subjected to partial fractionation with different polarity solvents including hexane, dichloromethane, ethyl acetate, and distilled water. Firstly, ethanol extract was distributed in hexane, filtered and concentrated by removing the solvent under the reduced pressure to obtain hexane fraction (HE). Similarly, the obtained residue was subsequently fractionated with dichloromethane, ethyl acetate, and distilled water to obtain dichloromethane fraction (DM), ethyl acetate fraction (EA), and distilled water fraction (H2O), respectively. 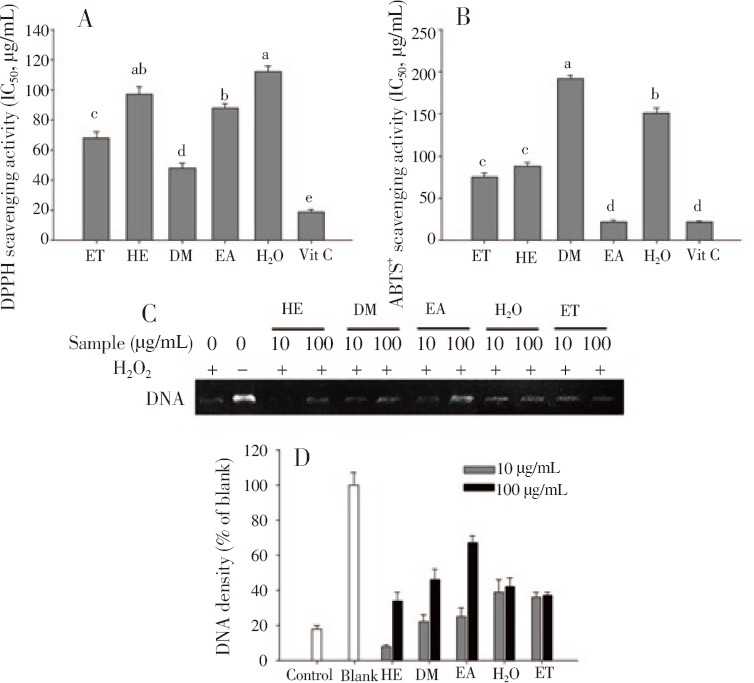 DNA oxidation assay was carried out according to Vo et al.. Briefly, a mixture of 10 μL of the tested sample at different concentrations (10 and 100 μg/mL) and DNA extract from human liver HepG2 cancer cell line (20 μg/mL) were incubated for 10 min at room temperature followed by the addition of 10 μM of Fenton's reagent (30 mM H2O2, 50 μM ascorbic acid, and 80 μM FeCl3). The mixture was kept at room temperature for 10 min and the reaction was terminated by adding ethylenediaminetetraacetic acid (10 mM). An aliquot (20 μL) of the reaction mixture was electrophoresed on a 1% agarose gel for 20 min at 100 V. Gels were then stained with 1 mg/mL ethidium bromide and visualised by UV light. Control group was not treated with the the tested sample while blank group was not treated with the tested sample and Fenton's reagent. The relative amounts of DNA were quantified by densitometric scanning (Luminescent image analyzer, Fujifilm Life Science, Tokyo, Japan). Densitometrically calculated expression levels of DNA were given as a percentage compared to blank group. The cells were cultured in a humidified atmosphere containing 5% CO2 at 37 °C using Dulbecco's modified eagle medium supplemented with 5% heat-inactivated fetal bovine serum, 10 mM HEPES buffer, 100 U/mL of penicillin G, and 100 mg/mL of streptomycin. The cells were maintained via two times passage per week, and cells were utilized for experimentation at a density of 70%-80%. In order to investigate NO production, the RAW 264.7 macrophage cells were pre-treated with avocado seed extract and fractions (100 μg/mL) before stimulation of lipopolysaccharide (LPS). NO level in the culture supernatant was measured by the Griess reaction as described by Vo et al.. The levels of NO production were calculated as a percentage compared to that of control (LPS treatment alone): Release ratio (%) = (T - B)/(C - B) × 100, where B is the group without stimulation as well as sample treatment, C is control group that was stimulated with LPS without presence of the tested sample, and T is the stimulated group with presence of the tested sample. To exclude the possibility that the inhibition of NO production was due to cytotoxicity effect, MTT assays were performed in RAW 264.7 macrophage cells pre-treated with 100 μg/mL of avocado extract and fractions for 24 h. The avocado seed extract and fractions were screened for anti-cancer activity via investigating the inhibitory effect on the proliferation of human lung A549 cancer cells and human gastric BGC823 cancer cells. The cells were treated with 200 μg/mL of avocado seed extract and fractions for 24 h and cell viability was then measured by MTT assay. The viability levels of the cells were determined according Vo et al. and calculated as a percentage compared to that of blank (no addition of tested sample). Data were analyzed using the analysis of variance (ANOVA) test of statistical package for the social sciences (SPSS). The statistical differences among groups were assessed by using Duncan's multiple range tests. Differences were considered significant at P < 0.05. In this study, the result of the proximate components of avocado seed was investigated. It showed that the lipid content in the avocado seed was (7.14 ± 0.40) g/100 g, meanwhile the carbohydrate content was (54.0 ± 1.2) g/100 g, and the protein content was (1.67 ± 0.03) g/100 g. Moreover, the ash content of avocado seed was indicated up to (2.60 ± 0.02) g/100 g. Notably, the total phenolic content presented (62.0 ± 2.3) mg GAE/g DWE in the ethanol extract of avocado seed. Accordingly, avocado seed contains substantial amount of nutrients that could warrant its utilization in food. The antioxidant activity of avocado seed extract and fractions was determined via measuring the free radical scavenging ability [Figure 1]. [Figure 1]A showed that DM fraction exhibited the highest DPPH scavenging activity with IC50 value of (48.0 ± 3.4) μg/mL, followed by ET extract [IC50 = (68.0 ± 4.0) μg/mL], EA fraction [IC50 = (88.0 ± 2.8) μg/mL], HE fraction [IC50 = (97.0 ± 5.2) μg/mL], and H2O fraction [IC50 = (112.0 ± 4.0) μg/mL]. Meanwhile, EA fraction exhibited the highest ABTS+ scavenging activity with IC50 values of (22.0 ± 1.8) μg/ mL, followed by ET extract [IC50 = (75.0 ± 5.0) μg/mL], HE fraction [IC50 = (88.0 ± 4.2) μg/mL], H2O fraction [IC50 = (151.0 ± 6.2) μg/mL], and DM fraction [IC50 = (192.0 ± 3.5) μg/mL] [Figure 1]B. On the other hand, the free radical scavenging activity of avocado seed extract and fractions was also confirmed via investigating the protective effect against H2O2-induced DNA damage. [Figure 1]C and [Figure 1]D showed that the significance of the light DNA band was not clear in the control group exposed by H2O2 alone. However, DM and EA fractions were observed to be effective in protection against H2O2-induced DNA damage at the concentration of 100 μg/mL. Meanwhile, ET extract as well as HE and H2O fractions possessed the moderate protective effect at the same concentration. Figure 1: Free radical scavenging activities of avocado seed extract and fractions. The DPPH (A) and ABTS+ (B) scavenging activity of avocado seed extract and fractions. IC50 is the half maximal inhibitory concentration of extract or fractions on DPPH or ABTS+ radicals. (C) Protective effect of avocado seed extract and fractions against H2O2-induced DNA damage. (D) Densitometrically calculated levels of DNA which were given as a percentage compared to the blank group. Ethanol extract (ET), hexane (HE), dichloromethane (DM), ethyl acetate (EA), and H2O fractions. 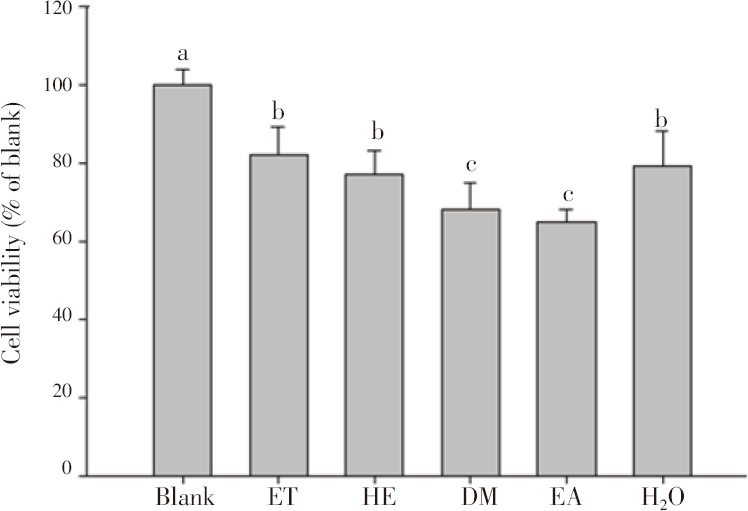 Different letters a-e indicated significant difference among groups (P < 0.05) by Duncan's multiple-range test. As shown in [Figure 2], NO production levels were observed to decrease as exposed to the extract and fractions. It indicated that ET extract was the strongest inhibitor of NO production, followed by EA, DM, HE, and H2O. Moreover, [Figure 3] showed that ET extract and H2O fraction have slight cytotoxicity effect, while HE, DM, and EA fractions possess the moderate cytotoxicity effect on RAW 264.7 macrophage cells. According to the result, the inhibitory effects of avocado seed extract and fractions were not due to cytotoxicity on RAW 264.7 macrophage cells. Figure 2: The inhibitory effect of avocado seed extract and fractions on NO production from LPS-stimulated RAW 264.7 macrophage cells. NO level was measured using the Griess reaction, and the results were expressed as percentage of control. Ethanol extract (ET), hexane (HE), dichloromethane (DM), ethyl acetate (EA), and H2O fraction. Different letters a-c indicated significant difference among groups (P < 0.05) by Duncan's multiple-range test. 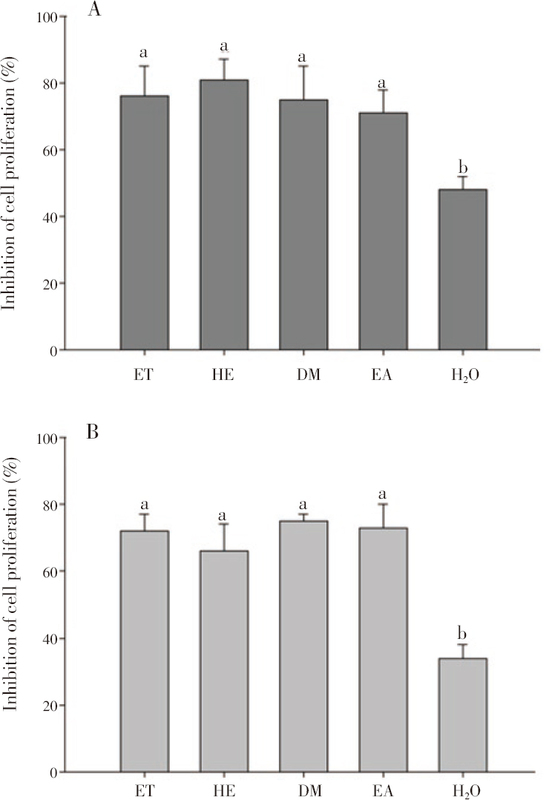 Figure 3: The effect of avocado seed extract and fractions on RAW 264.7 macrophage cell viability. Cell viability was assessed by MTT method, and the results were expressed as percentage of surviving cells over blank cells. Ethanol extract (ET), hexane (HE), dichloromethane (DM), ethyl acetate (EA), and H2O fraction. Different letters a-c indicated significant difference among groups (P < 0.05) by Duncan's multiple-range test. The result showed that avocado seed extract and fractions had significant inhibition on both human lung A549 and human gastric BGC823 cancer cells at the concentration of 200 μg/mL [Figure 4]. The highest inhibition on human lung A549 cancer cells was observed by HE fraction, followed by ET, DM, EA, and H2O. Meanwhile, DM exhibited the strongest inhibition on human gastric BGC823 cancer cells, followed by EA, ET, HE and H2O. The inhibition of avocado seed on human lung A549 cancer cells was slightly higher than that of human gastric BGC823 cancer cells. Figure 4: The inhibitory effects of avocado seed extract and fractions on proliferation of human lung A549 cancer cells (A) and human gastric BGC823 cancer cells (B). Cell viability was assessed by MTT method, and the results were expressed as percentage of surviving cells over blank cells. Ethanol extract (ET), hexane (HE), dichloromethane (DM), ethyl acetate (EA), and H2O fractions. Different letters a-b indicated significant difference among groups (P < 0.05) by Duncan's multiple-range test. Avocado fruit processing leads to the release of high amount of byproducts such as seed and peel that are normally discarded. These by-products cause environmental problems and economic losses due to waste disposal. Therefore, it is important to utilize these by-products as sources of food supplements or medicinal products. It showed that the lipid content was (7.14 ± 0.40) g/100 g that was higher than that [(1.87 ± 0.31) g/100 g] reported by Bora et al.. However, it was slightly lower than lipid contents reported by Oluwole et al. [(12.24 ± 0.07) g/100 g] and Arukwe et al. [(16.54 ± 2.10) g/100 g]. Furthermore, the carbohydrate content was determined to be (54.0 ± 1.2) g/100 g that was slightly higher than carbohydrate reported by Arukwe et al. [(48.11 ± 4.13) g/100 g]. In addition, the avocado seed presented a protein content of (1.67 ± 0.03) g/100 g that was similar with the protein amount reported by Bora et al. [(1.95 ± 0.16) g/100 g]. Besides, the ash content, which is considered as minerals in a plant, was also investigated. The ash content of avocado seed in the present study was slightly higher than that reported by Arukwe et al. [(2.40 ± 0.19) g/100 g] and significantly higher than that recorded by Oluwole et al. [(1.15 ± 0.03) g/100 g] and Bora et al. [(1.87 ± 0.24) g/100 g]. Especially, the total phenolic content of ethanol extract of avocado seed was found to be higher than that reported by Tremocoldi et al. [(57.0 ± 2.3) mg GAE/g DWE], Rodríguez-Carpena et al. [(35.0 ± 9.8) mg GAE/g DWE], and Githinji et al. [(18.0 ± 2.8) mg GAE/g DWE]. Phenolic compounds are known to act as antioxidants due to donating hydrogen or electrons. With the total phenolic content value of [(62.0 ± 2.3) mg GAE/g DWE], avocado seed was suggested to be a rich source of phenolic compounds, thus bringing about its high antioxidant activity. A free radical is considered as a molecule that contains one or more unpaired electrons in its outermost atomic or molecular orbital. It is generated from endogenous sources such as intracellular auto-oxidation and inactivation of small molecules or from exogenous sources such as tobacco smoke, certain pollutants, organic solvents, and pesticides. The overproduction of free radicals can result in oxidative stress, causing the destructive process due to harming certain cell structures such as cell membranes, DNA, and proteins. It leads to human aging and various diseases such as atherosclerosis, inflammation, and certain cancers. Thus, the high antioxidant agents from natural products would contribute an important role in prevention and treatment of free radical-caused diseases. In this study, DM and EA were found to be effective in scavenging DPPH and ABTS+ radicals. Moreover, these fractions exhibited the highest protective effect against H2O2-induced DNA damage. So far, various solvents with different polarities were applied for isolation of different polarity antioxidants. In this study, the solvents with moderate polarity such as dichlomethane and ethyl acetate were suitable for extracting potential DPPH and ABTS+ radical scavenging components. On the other hand, Antasionasti and colleagues have reported that the fractionation of methanolic extract of avocado peel was able to scavenge DPPH and ABTS+ radicals with IC50 values of (4 221 ± 137) μg/mL and (855 ± 13) μg/mL, respectively. Moreover, Melgar and colleagues have shown that avocado peel and seed scavenged 50% DPPH radical at the concentration of 149 and 220 μg/mL. As indicated in the result, the scavenging activity of avocado seed in the present study was significantly stronger than that of avocado peel and seed in the previous studies. It indicates that avocado seed may contain various active components, especially polyphenols with moderate polarity and high antioxidant activity. NO is known as an important mediator in inflammatory response. The activation of macrophages in inflammatory reaction leads to the release of a variety of effector molecules, including NO. The treatment with NOS inhibitors reduces the degree of inflammation in rats with acute inflammation. Therefore, NO is indicated to play a part in the acute and chronic inflammation. Herein, ET extract was showed to be the strongest inhibitor of NO production without significant cytotoxicity on RAW 264.7 macrophage cells. According Kim and colleagues, Persenone A and B from avocado fruit were determined to be novel inhibitors of NO production from RAW 264.7 macrophage cells. Their inhibitory activities on NO production (IC50 = 1.2 and 3.5 μM respectively) were comparable to or higher than that of a natural NO production inhibitor, docosahexaenoic acid (IC50 = 4.3 μM). Accordingly, ET extract was considered to contain the potential components such as polyphenols that was able to down-regulate the inflammatory response via decreasing the pro-inflammatory mediator production. Cancer is one of the major reasons for death due to its rapid pace of development and the lack of efficient treatments. The breast, lung, gastric, colorectal, and esophageal cancers are the most common types of cancer nowadays. Notably, proliferation plays an important role in cancer development and progression. Thus, the important parameter for screening anti-cancer agents is suppressing cancer cell proliferation. In this study, the avocado seed extract and fractions have significant inhibition on both human lung A549 and human gastric BGC823 cancer cell proliferation, except H2O fraction. Abubakar and colleagues have determined that triterpenoid compound from ethanol extract inhibited cell proliferation of human breast cancer cell line (MCF-7) and human hepatocellular carcinoma cell line (HepG2) with the IC50 values of 62 μg/mL and 12 μg/mL, respectively, and was safe to normal cells. Moreover, Alkhalf and colleagues also reported the inhibition of avocado fruit and seed on the cell proliferation of HepG2 and colon cancer cell line (HCT116). In addition, avocado fruit was showed to inhibit the cell proliferation of HepG2 and HCT116 with IC50 values of 58 μg/mL and 14 μg/mL, respectively. Meanwhile, avocado seed significantly suppressed the cell proliferation of HepG2 and HCT116 with IC50 values of 12 μg/mL and 3 μg/mL, respectively. According to the results of the present study, avocado seed may be considered as potential materials for isolation of the effective anti-cancer compounds that can be applied as natural chemotherapy of various cancer types. Natural polyphenols are widely distributed in the plants, foods, and beverages that have been shown to possess numerous biological activities and health benefits. Moreover, it was evidenced that polyphenols have strong antioxidant capacities due to scavenging of free radicals, inhibiting lipid oxidation, and reducing hydroperoxide formation. Especially, polyphenols exhibited potential immune-modulatory and anti-inflammatory effects. Additionally, the anticancer activity of polyphenols was also proved at mouth, stomach, duodenum, colon, liver, lung, mammary gland or skin. Notably, avocado seed was revealed to be potential source of phenolic compounds. Therefore, the biological activities of avocado seed extract in the present study may be related to phenolic compounds. In conclusion, this study has indicated the chemical components and the potential health beneficial effects of avocado seed such as antioxidant, anti-inflammatory, and anti-cancer activities. The chemical components of avocado seed have been determined to be high in carbohydrates and total phenolic contents. Notably, the avocado seed effectively scavenged various free radicals and significantly inhibited cancer cell proliferation in vitro. These promising pharmaceutical properties indicate the values of the waste parts of the avocado fruits. However, the further studies on identifying the active compounds and determining the spectrum of biological activities of avocado seed are necessary. Moreover, the additional researches will reveal whether these promising results are able to translate into clinically or nutritionally useful agents. This research is funded by NTTU Foundation for Science and Technology Development under grant number: 2018.01.21, Nguyen Tat Thanh University, Ho Chi Minh city, Vietnam. Sagar NA, Pareek S, Sharma S, Yahia EM, Lobo MG. Fruit and vegetable waste: Bioactive compounds, their extraction, and possible utilization. Compr Rev Food Sci Food Saf 2018; 17: 512-531. Iriondo-DeHond M, Miguel E, Del Castillo MD. Food byproducts as sustainable ingredients for innovative and healthy dairy foods. Nutrients 2018; 10: E1358. Dabas D, Shegog RM, Ziegler GR, Lambert JD. Avocado (Persea americana) seed as a source of bioactive phytochemicals. Curr Pharm Des 2013; 19(34): 6133-6140. Duarte PF, Chaves MA, Borges CD, Mendonça CRB. Avocado: Characteristics, health benefits and uses. Ciênc Rural 2016; 46(4): 747-754. Dreher ML, Davenport AJ. Hass avocado composition and potential health effects. Crit Rev Food Sci Nutr 2013; 53(7): 738-750. Ding H, Chin YW, Kinghorn AD, D'Ambrosio SM. Chemopreventive characteristics of avocado fruit. Semin Cancer Biol 2007; 17(5): 386-394. Abaide ER, Zabot GL, Tres MV, Martins RF, Fagundez JL, Nunes LF, et al. Yield, composition, and antioxidant activity of avocado pulp oil extracted by pressurized fluids. Food Bioprod Process 2017; 102: 289-298. Au RY, Al-Talib TK, Au AY, Phan PV, Frondoza CG. Avocado soybean unsaponifiables (ASU) suppress TNF-alpha, IL-1beta, COX-2, iNOS gene expression, and prostaglandin E2 and nitric oxide production in articular chondrocytes and monocyte/macrophages. Osteoarthritis Cartilage 2007; 15(11): 1249-1255. Calderón-Oliver M, Escalona-Buendía HB, Medina-Campos ON, Pedraza-Chaverri J, Pedroza-Islas R, Ponce-Alquicira E. Optimization of the antioxidant and antimicrobial response of the combined effect of nisin and avocado byproducts. Food Sci Technol 2016; 65: 46-52. Odo CE, Nwodo OFC, Joshua PE, Omeh YS, Okonkwo CC, Gometi AS, et al. Anti-motility and reductions in the concentrations of gut electrolytes: Mechanisms for the anti-spasmodic use of the seeds of avocado (Persea americana Mill) in folk medicine. Afr J Biotechnol 2013;12: 5610-5617. Olson BJ, Markwell J. Assays for determination of protein concentration. Curr Protoc Protein Sci 2007. Doi: 10.1002/0471140864.ps0304s48. Paola ELD, Montevecchi G, Masino F, Antonelli A, Fiego DPL. Single step extraction and derivatization of intramuscular lipids for fatty acid UltraFast GC analysis: Application on pig thigh. J Food Sci Technol 2017; 54(3): 601-610. Le PU, Ngo DH, Vo TS. 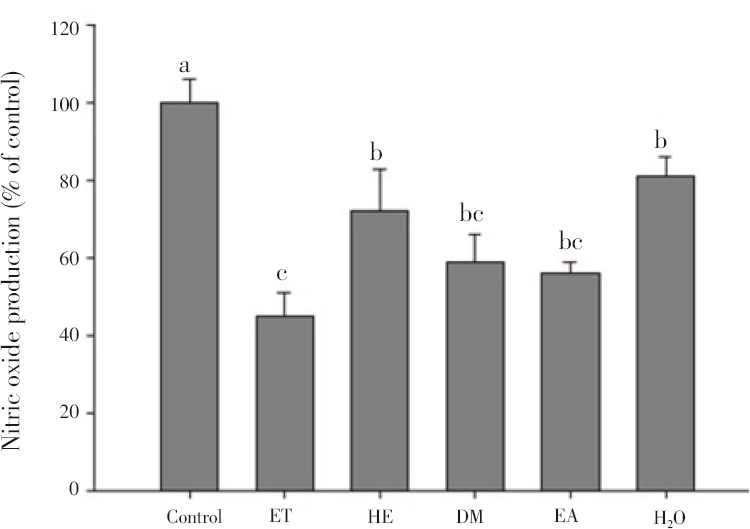 Optimization of extraction conditions for achieving high content and antioxidant activities of the total phenolic compounds of phu quoc sim fruit (Rhodomyrtus tomentosa (Aiton) Hasak.). J Medicinal Mater 2018; 23: 157-166. Vo TS, Le PU, Ngo DH. The increased gamma-aminobutyric acid content by optimizing fermentation conditions of bacteria from kimchi and investigation of its biological activities. Eur Asian J Bio Sci 2018; 12: 369-376. Vo TS, Ngo DH, Bach LG, Ngo DN, Kim SK. The free radical scavenging and anti-inflammatory activities of gallate-chitooligosaccharides in human lung epithelial A549 cells. Process Biochem 2017; 54: 188-194. Vo TS, Ngo DH, Ta QV, Wijesekara I, Kong CS, Kim SK. Protective effect of chitin oligosaccharides against lipopolysaccharide-induced inflammatory response in BV-2 microglia. Cell Immunol 2012; 277(1-2): 14-21. Leite JJG, Brito EHS, Cordeiro RA, Brilhante RS, Sidrim JJ, Bertini LM, et al. Chemical composition, toxicity and larvicidal and antifungal activities of Persea americana (avocado) seed extracts. Rev Soc Bras Med Trop 2009; 42(2): 110-113. Bora PS, Narain N, Rocha RVM, Paulo MQ. Characterization of the oils from the pulp and seeds of avocado (cultivar: Fuerte) fruits. Grasas y Aceites 2001; 52: 171-174. Oluwole S, Yusuf K, Fajana O, Olaniyan D. Qualitative studies on proximate analysis and characterization of oil from Persea americana (Avocado Pear). J Nat Sci Res 2013; 3: 68-73. Arukwe U, Amadi BA, Duru MKC, Agomuo EN, Adindu EA, Odika PC, et al. Chemical composition of Persea americana leaf, fruit and seed. IJRRAS 2012; 11(2): 346-349. Tremocoldi MA, Rosalen PL, Franchin M, Massarioli AP, Denny C, Daiuto ÉR, et al. Exploration of avocado by-products as natural sources of bioactive compounds. PLoS One 2018; 13(2): e0192577. Rodríguez-Carpena JG, Morcuende D, Andrade MJ, Kylli P, Estévez M. Avocado (Persea americana Mill.) phenolics, in vitro antioxidant and antimicrobial activities, and inhibition of lipid and protein oxidation in porcine patties. J Agric Food Chem 2011; 59(10): 5625-5635. Githinji P, Gitu L, Marete E, Githua M, Mugo M, Mbaka EN. Quantitative analysis of total phenolic content in avocado (Persia americana) seeds in eastern province of Kenya. Chem Matl Res 2013; 3(10): 48-51. Huyut Z, Beydemir Ş, Gülçin İ. Antioxidant and antiradical properties of selected flavonoids and phenolic compounds. Biochem Res Int 2017; 2017: 7616791. Perrone S, Santacroce A, Longini M, Proietti F, Bazzini F, Buonocore G. The free radical diseases of prematurity: From cellular mechanisms to bedside. Oxid Med Cell Longev 2018; 2018: 7483062. Sun MS, Jin H, Sun X, Huang S, Zhang FL, Guo ZN, et al. Free radical damage in ischemia-reperfusion injury: An obstacle in acute ischemic stroke after revascularization therapy. Oxid Med Cell Longev 2018; 2018: 3804979. Szymanska R, Pospíšil P, Kruk J. Plant-derived antioxidants in disease prevention 2018. Oxid Med Cell Longev 2018; 2018: 2068370. Antasionasti I, Riyanto S, Rohman A. Antioxidant activities and phenolics contents of avocado (Persea americana mill.) peel in vitro. Res J Med Plant 2017; 11: 55-61. Melgar B, Dias MI, Ciric A, Sokovic M, Garcia-Castello EM, Rodriguez-Lopez AD, et al. Bioactive characterization of Persea americana Mill. by-products: A rich source of inherent antioxidants. Ind Crop Prod 2018; 111: 212-218. Soufli I, Toumi R, Rafa H, Touil-Boukoffa C. Overview of cytokines and nitric oxide involvement in immuno-pathogenesis of inflammatory bowel diseases. World J Gastrointest Pharmacol Ther 2016; 7(3): 353-360. Cabral GRA, Wang ZT, Sibley LD, DaMatta RA. Inhibition of nitric oxide production in activated macrophages caused by toxoplasma gondii infection occurs by distinct mechanisms in different mouse macrophage cell lines. Front Microbiol 2018; 9: 1936. Poulos TL, Li H. Nitric oxide synthase and structure-based inhibitor design. Nitric Oxide 2017; 63: 68-77. Kim OK, Murakami A, Nakamura Y, Takeda N, Yoshizumi H, Ohigashi H. Novel nitric oxide and superoxide generation inhibitors, persenone A and B, from avocado fruit. J Agric Food Chem 2000; 48(5): 1557-1563. Bray F, Ferlay J, Soerjomataram I, Siegel RL, Torre LA, Jemal A. Global cancer statistics 2018: GLOBOCAN estimates of incidence and mortality worldwide for 36 cancers in 185 countries. CA Cancer J Clin 2018; 68(6): 394-424. Feitelson MA, Arzumanyan A, Kulathinal RJ, Blain SW, Holcombe RF, Mahajna J, et al. Sustained proliferation in cancer: Mechanisms and novel therapeutic targets. Semin Cancer Biol 2015; 35: S25-S54. Abubakar ANF, Achmadi SS, Suparto IH. Triterpenoid of avocado (Persea americana) seed and its cytotoxic activity toward breast MCF-7 and liver HepG2 cancer cells. Asian Pac J Trop Biomed 2017; 7(5): 397-400. Alkhalf MI, Alansari WS, Ibrahim EA, ELhalwagy MEA. Anti-oxidant, anti-inflammatory and anti-cancer activities of avocado (Persea americana) fruit and seed extract. J King Saud Univ 2018. Doi: 10.1016/ j.jksus.2018.10.010. Cory H, Passarelli S, Szeto J, Tamez M, Mattei J. The role of polyphenols in human health and food systems: A mini-review. Front Nutr 2018; 5: 87. Teplova VV, Isakova EP, Klein OI, Dergachova DI, Gessler NN, Deryabina YI. Natural polyphenols: Biological activity, pharmacological potential, means of metabolic engineering. Appl Biochem Micro 2018; 54(3): 221-237. Yahfoufi N, Alsadi N, Jambi M, Matar C. The immunomodulatory and anti-inflammatory role of polyphenols. Nutrients 2018; 10: 1618. Dei Cas M, Ghidoni R. Cancer prevention and therapy with polyphenols: Sphingolipid-mediated mechanisms. Nutrients 2018; 10(7): 940.